The decision to have a wedding is huge for a couple. Not only are they deciding to spend their life together but there is also the strain of affording the perfect wedding and having everything they want on their special night. The main focus for any couple when creating a wedding budget would be to concentrate on what they are looking to get out of their wedding, how much disposable income the couple has together and how much money they need to have left after planning their special day. This must involve all costs associated with a wedding, from venue to food and all of the tips that you plan to provide to workers after the fact. 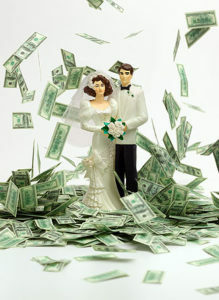 Make sure to also take into considerations any minor issues or need for side cash that might arise during the wedding. Generally, an extra $3000 would be recommended just because it is always good to have a nice bumper fund. Sometimes, this step is easier to accomplish at the end of doing some basic planning for your big day. Until you know more than the basic details it’s difficult to decide how much everything will cost.